Kerry started in photography at the age of 14 with a small $12 camera. With no money and only a passion for photography he was able to win two first place finishes in competitions with just that small camera. It also lead to the understanding that great photography is not about the equipment, but rather the vision. 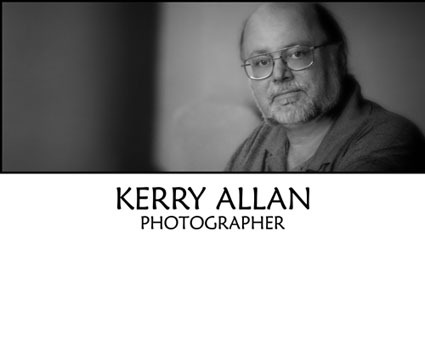 Now, for over 15 years, Kerry Allan has been presenting Photographic Workshops to photographers, and right from the very beginning they've always had the key feature of "Hands On" participation. Kerry believes that people learn best when they can participate. "So many photo seminars are simply sales pitches for books or videos" says Kerry, " You can't learn to play the piano from a video tape. You need an instructor to sit on the bench beside you. And it's the very same when learning the advanced techniques of professional photography." We're dedicated to helping professional photographers succeed in an ever changing field. To help them navigate their way to business success. Today, with the advances to the Internet, we're able to bring our unique brand of photographic education to the online world. with our extensive collection of media from Webinars to our exclusive "Ditto Cam" collection, we offer some of the best education for the photographic market. It all started here. I thought it would be cool to have a forum where my photo students could post their work from the seminars for me to review. The design of the first forum started and some structure was put in place, but time was short and it was put on the shelf for quite some time. Renewed effort at last Our seminars were much more active now, and students had really started to join in. Our progress however, was hampered by the weak forum software we were using. We begin our national membership drive. Completed the upgrade to our new forum software (vBulletin) which we use to this day. This gave us the features we needed to really take off. Membership is rising fast. The word is getting out. With our seminars going strong, we add our first live showcase at Planet Hollywood Las Vegas during the WPPI convention. While attendance was small, it set the foundation for our PSH Seminar style. All live shoots. We break out a wild series of Webinars featuring Mitch Graf, Steven and Jennifer Bebb, Marilyn Sholin, and Shel Holtz all in one month. Wow, what a great time. With the overwhelming response to her first Webinar, Sandy Puc' does two follow up Webinars to complete the Bellies and Babies series. Signups for the additional Webinars come in so fast it crashes our server. Just as I was ready to leave to speak at the NOBS Inferno in Nashville, hackers got into our server and brought us down. The server was not recoverable. Over a nightmarish 48 hours primary functions were restored on an all new server. My many thanks to the technicians at the Austin Data center for their assistance in deploying our new server by working thru the night. PSH creates another first with the final testing of the PSH Ditto Cam Seminars. This allows a specially equipped studio to broadcast a live feed of our in-house seminars over the Internet for users to watch, listen and participate. A regular schedule is created to start in Jan/2010. I couldn't contain my excitement when I got a call from Sandy Puc'. She had thought about the 3 Webinars she'd done with us and was so happy with them she offered to continue to do regular monthly Webinars with PSH for the next 12 months, with a possibility of extending another 12 months after that. Mar. 18, 2010 - PSH holds it's largest Webinar ever with over 1500 people registered and 1000 in attendance. Sandy Puc' does it again. Oct. 1, 2011 - PSH Goes Mobile - Beta testing complete - PSH forum software becomes mobile compatible. Oct. 15, 2011 - The first (to our knowledge) PSH marriage occurs PSH Moderators Maria and Lee tie the knot. April 2012 - Inferno in Toronto breaks attendance record. Awesome Time.